Here's Random.Brady riding a tricycle. This is my parent's backyard and the lovely photograph was taken by my stepsister Kira who did all my maternity pictures. Isn't he the cutest?? Thats' my HAPPY boy! That's the one compliment I get from strangers all that time and it makes me SO proud and joyful. People tell me "Oh, he's such a happy boy!" I love it! Nothing better than being happy, not being cute, not being well behaved. I'll take happy any day. Ok, the winner of the amazing earrings from Opalescence is Jenn! You can check out her awesome layout HERE! Big thanks to Opal for the awesome inspiration and the amazing giveaway! Jenn, can you email me with your address which I'm SURE I have but I'm entirely too tired to look for?? Thanks for considering me! I am having a blast with these challenges!!! It is wonderful when someone gives you such an awesome compliment about your child! What a great picture to go with it!! I'm definitely interested in the DT spot and/or guest spot! Trying to "write" my own hyperlinks was a bust...ahh, technology! I included 29-33. Hi Ashley!! I would LOVE to be on your DT in whatever capacity you can use me. Here are my posts. Brady is such a cutie! I love it when you post pics of him. He reminds me of some of the pics of Cody when he was that age. I would love to be a permanent member of your amazing DT ashley, and even a GDT spot would be heavenly! Brady is so happy, love it! Here are my links sweetie! a couple extra posts too..
Brady is such a doll! That is a great photo, Ashley! Would love a spot of the DT! Here are my posts! Your step sis did a great jobs with the pics! Brady does look so happy here... and he is just too darn cute too! 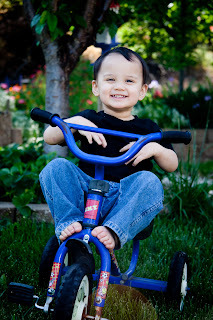 Random.Brady looks so cute, and I really like him on the Tryke, and I love that he is always such a Happy kid. Happy people are always way better off then well behaved or cute people!!! Not that he is not well behaved or cute, but you know what I mean!!! hey girl am I still on time?